Another day down, another long list of items to discuss. With summer officially over, it’s time to start focusing in on the fall releases. Tomorrow will see the official release of LVL UP’s Hoodwink’d, one of the year’s best records. Similarly, in a few weeks Iceage will release Plowing Into the Field of Love, a record that continues to expand on its promise in leaps and bounds. Before discussing that last point in greater detail, it’s worth mentioning that incredible new pieces of content are appearing with a regularity that’s starting to border the tenacious. Today alone saw the unveiling (or first notable coverage) of music videos from WAND, Lonesome Shack, The Wans, and an absolutely stunning effort from Cloud Castle Lake that plays with space in a manner so fascinating that it nearly earned a very lengthy write-up as today’s feature by virtue of that aspect alone. There was a very strong 7″ that surfaced from Terry & Louie, a duo composed of Terry Six and King Louie Bankston- who both formerly played in The Exploding Hearts (among many other great subsequent projects). And, as always, there were songs- including (but certainly not limited to): a hypnotic Nick Cave-assisted effort by Marianne Faithfull, the first look at Sundials’ Kick, a previously cassette-only exclusive track from Alvvays, Gnarwhal‘s contribution to an upcoming four-way split that boasts some of the year’s most intriguing names, and “Audrey’s Song“- a sampling of Trophy Wife’s just-released All The Sides. 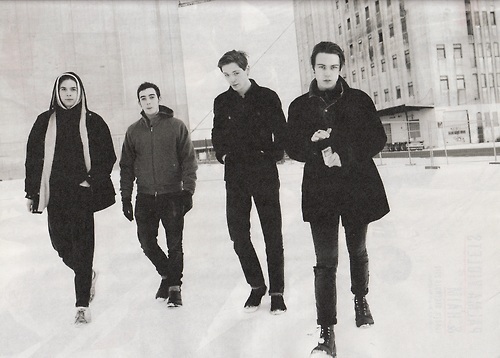 Now, onto the main event- which once again comes courtesy of Iceage. Following the excellent trio composed of “The Lord’s Favorite“, “Forever” and “How Many“, comes “Glassy Eyed, Dormant and Veiled”. After an impressive array of combative styles that proved to be even more antagonistic that the band’s earliest material, “Glassy Eyed, Dormant and Veiled” finds the band reining things back into an unexpected level of restraint, showing an admirable self-awareness that suggests a talent for composition well beyond their years. Recalling an alternately nightmarish Henry’s Dream with this particular at bat, Iceage have managed to definitively establish a creative growth that should pay massive dividends for them once Plowing Into the Field of Love is revealed in full. Guitars course, the prose rages, and the rhythm section manages to be more imposing than ever before. Importantly, it also enhances the band’s newfound penchant for Southern Gothic to an extent that’s, arguably, even more fully-formed than “How Many”. While it’s still too early to declare it a bona fide masterwork, everything that the four preview tracks have shown, in one way or another, suggests that may be exactly how Plowing Into the Field of Love will come to be defined. If Plowing Into the Field of Love is rounded out by songs that live up to “Glassy Eyed, Dormant and Veiled” (or any of the other three that have been released) and Iceage continues to make music that sounds this brave and timeless, they may wind up being one of this generation’s most celebrated bands. Whatever does wind up happening when Iceage is allowed their big moment, it’ll be worth paying very close attention to- this has already demonstrated the potential to be a watershed moment. “Glassy Eyed, Dormant and Veiled” is just another running step forward towards a full-on cliff dive and if the take-off is as spectacular as the song, we’re all in for one hell of a ride. Listen to “Glassy Eyed, Dormant and Veiled” below and pre-order Plowing Into the Field of Love here.